Do you need a full color image on your promotional product? Have you been told it was not possible or not available? We have the solution. 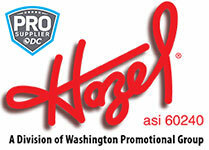 Washington Promotional Group's Full Color Process. Almost all of our products in this catalog are available with a full color process imprint. This state-of-the-art technology offers your more choices than ever before. Think color, use WPG's full color process on your next item. Set-Up $80.00 (G). Call company for a quote on any item, or fill out the form below. Running charge will vary based on square inch of coverage and item. No Minimums - Few Limitations.